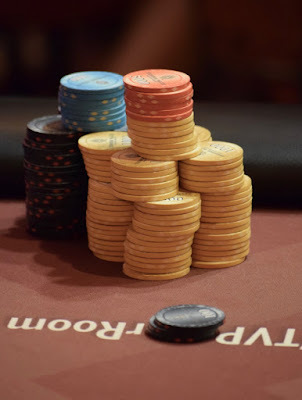 Here's a look around the tournament area as players have completed 13 30-minute levels in Day 1A of the $100,000 Guaranteed @WPTDeepStacks Championship Series $560 Kickoff Event. Lay Saelee has THE BigStack, well clear of any other player at this point. Normally, you'd see a photo of the chipleader with a post like this but, well, he wasn't at his seat so feast your eyes on his chips instead.